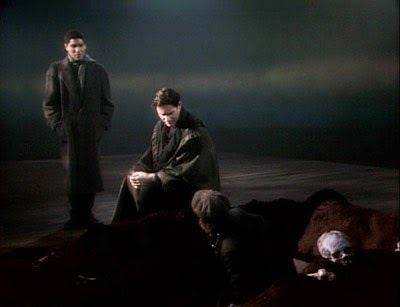 Another adaptation that cuts the 2nd Clown and a few lines besides, the sequence begins with the Gravedigger singing for quite a long time as Hamlet and Horatio approach. Kline's Hamlet is filled with foreboding, as if returning to Denmark to find his grave there, which is in fact what IS happening. There is an interesting hesitation when he inquires if it is a woman's grave, fearing it might be his mother's or Ophelia's, though his worries are dispelled by the clown's amusing rhetoric. MacIntyre Dixon really plays the character as a classic fool, drinking, giggling and taking his time, he is somewhat dense and generally tedious, but can tell what any fool can. The joke goes on a bit too long for Hamlet. Kline's interaction with Yorick's skull is far more sober than most, keeping it at a certain distance and only the very end smiling wistfully. He doesn't seem transported to a happier time, but rather forces himself to look at the thing Yorick has become, resentful and almost angry that life is rendered into dust in the end. 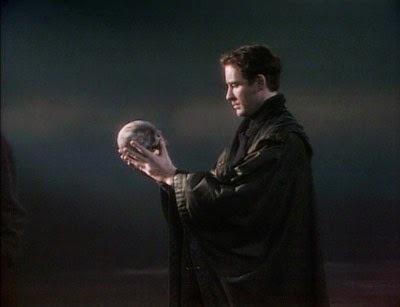 When this Hamlet asks Yorick where his flashes of merriment have gone, their loss is keenly felt, and questions about the undiscovered country are once again raised.